I had something “hatching” a just a little while ago. Well, this is it ! 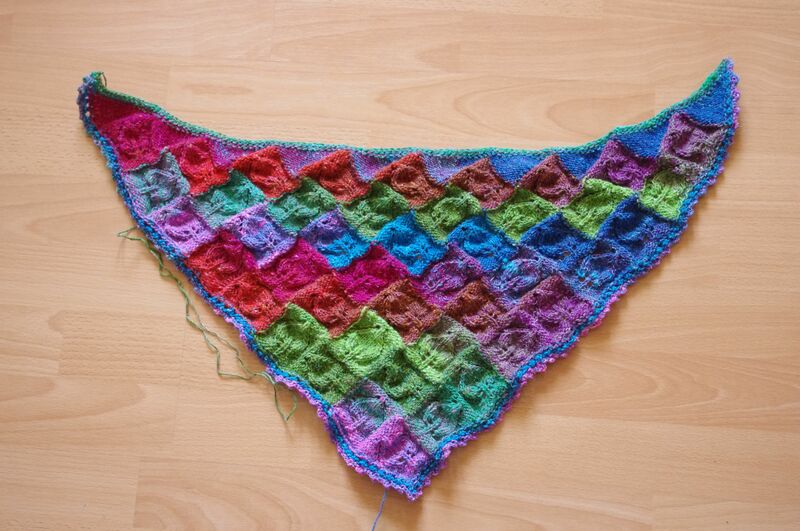 It’s a shawlette made from just one skein of Noro’s Silk Garden (S304). Noro apparently sources its fleece from organic farms and tries to use nonpolluting dyes, which I hope is true, because it would spoil my delight at this new neckwarmer thingy if it wasn’t. 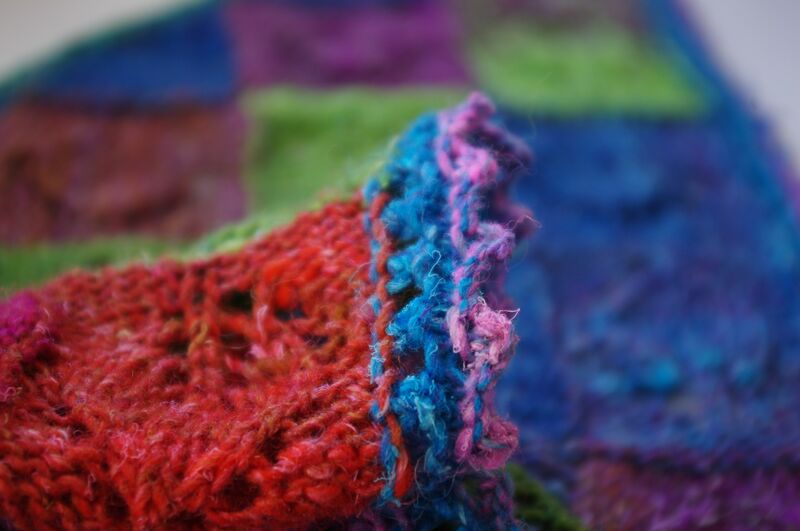 Anyway, it is an entrelac shawlette, and as it has been said many a time before, Noro seems to have been invented for entrelac, or entrelac seems to have been invented for Noro, whichever way you would prefer to have it. I was in need for some bright, cheerful colours, and I couldn’t have better chosen the yarn. Actually, I had bought it to knit some socks. Then I looked at it and pondered. This yarn was just too lovely to spend its days hidden under shoes and trousers. Then, socks wear out, and have to be darned until they’re past repair and disposed with, and I knew I would hate to see this yarn undergo such a process. I spent some time looking on Ravelry for a pattern which would be a good match for these bright and happy shades and finally settled on Jane Araujo’s Dianna. Dianna is a clever pattern that devilishly combines entrelac and lace, so it does take some time to wrap one’s head around it. But once this is done, the rest is a breeze, making it a perfect traveling project. A good part of my Dianna was knit on the train. That said, I’m not quite sure I have completely understood how the construction was supposed to work, since some of my squares look more like rectangles. I don’t know what happened there. Oh well, never mind. 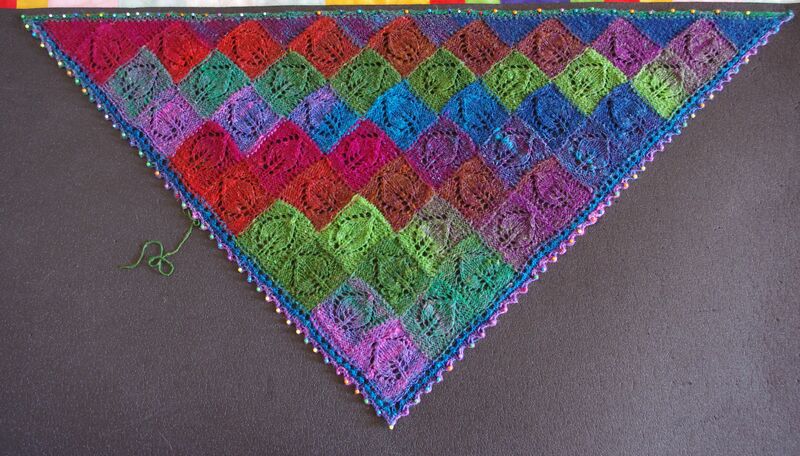 One of the main reasons why I chose this pattern was that each entrelac square (or, er, rectangle) features a little lacy leaf. This really appealed to me, as spring is underway and everything is blossoming or burgeoning, and the mountains around our place are covered in an extraordinary green between the last patches of snow. Then it is Lent, and Lent is a good time to think about everything new : new life, new creation, new creatures, new births. I thought this combination of yarn and pattern would be in harmony with such a theme, and it was. I knit the pattern without modifications for the main body. I briefly considered swapping the lace pattern for another, but decided against it. Of course, Dianna is meant to be a full-sized shawl, and I only had one skein of sock yarn, so I resized it to a smaller version. I had yarn enough to knit 9 whole tiers plus the “fill-in” triangles, and add an edging (I opted for something rather simple : one knit row, one eyelet row, two knit rows and a picot bind-off). As usual, blocking really felt like performing some kind of magic trick, at the end of which an unattractive crumply rag suddenly transformed in a thing of beauty. Speaking of blocking, I have a mystery to solve. I used to have a blocking kit, you know, one of these useful sets of blocking wires, T-shaped pins and a big, heavy-duty ruler giving measurements both in inches and centimeters. Then we moved and it disappeared into thin air. Well, that’s actually untrue : it has to be somewhere in this house. But where ? All in all, this was a completely addictive and thoroughly enjoyable knit. 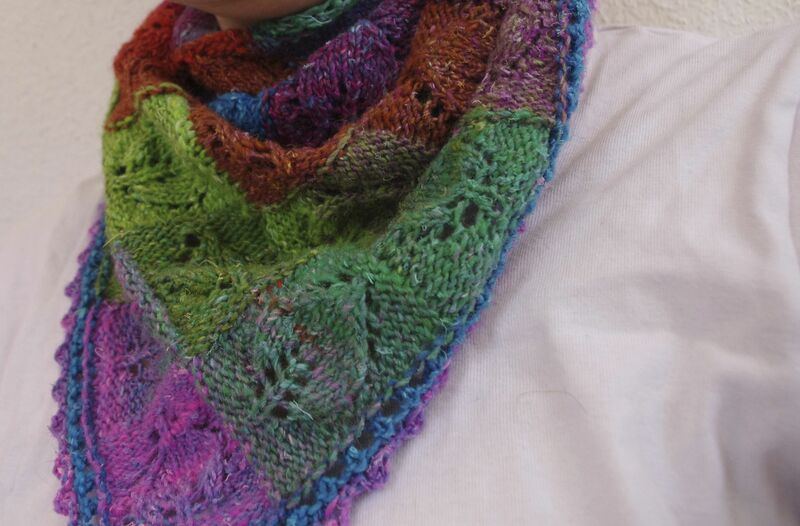 I liked the pattern, I like the yarn, and I’m seriously considering knitting a second one for someone’s birthday (these colours, as much as I love them, are not that someone’s cup of tea). But before I do so, I have other things on my needles waiting for attention ! 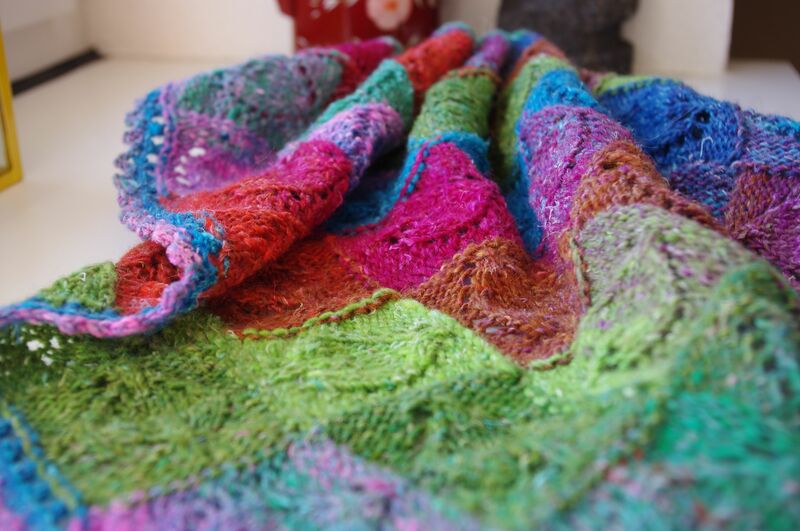 This entry was posted in Finished Knits and tagged entrelac, noro by Julie Paik. Bookmark the permalink.